How many times have you found yourself in this situation? You're just hanging out and watching TV when all of a sudden *BOOM* zombies come pouring in through your living room window. Happens to us all the friggin' time and now we are no longer getting caught with our pants down (depending on what we're watching on said TV of course). Behold, the Zombie tested and victim approved Safe Bedside Table. Getting rushed by flesheaters? No problem! 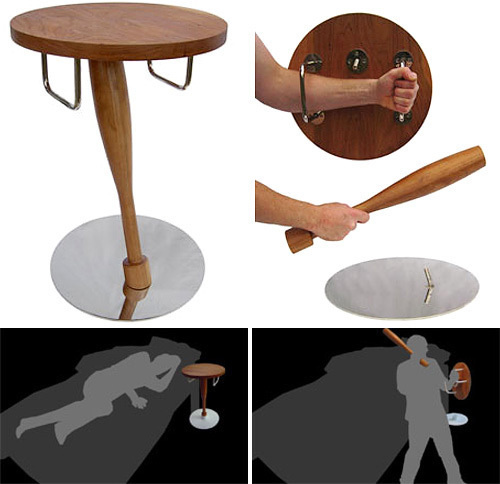 The Safe Bedside Table has a removable leg that acts as a club and a top that doubles as a shield for self-defense. الترابيزة من صنع ماك آدم الانجليزى الأصل و الذى يقدم ابتكاراته على الدوام عبر موقعه الأليكترونى ، و قد حاولت الاتصال بماك للحصول على توكيل للترويج للترابيزة داخل مصر خاصة بعد تجديد قانون الطوارئ ، ماحدش ضامن مين هايكسر عليه الباب اليومين دول.